South African side SuperSport United play two crucial matches in the space of five days in the last week of Stuart Baxter's time as coach. Former South Africa captain Eric Tinkler takes over from Baxter on 1 July. Baxter, who is now the South Africa coach, is concentrating on Saturday's South African Cup final against Orlando Pirates. Tembo also took charge for the away tie between the two sides earlier this month. "It is taxing to play Mazembe and Pirates within five days," admitted Jeremy Brockie, who is the top-scorer in the Confederation Cup so far with seven goals. "But facing a strong team like Mazembe before the cup final is good for us." SuperSport without many of their first choice regulars came from two goals behind to hold Mazembe 2-2 in Lubumbashi this month. 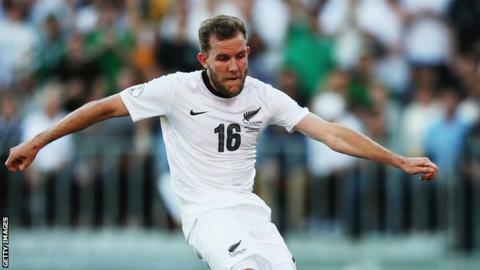 "We made sure the most influential Mazembe players were not allowed time on the ball and that affected their teamwork," added the 29-year-old former New Zealand striker Brockie. SuperSport, Mazembe and Horoya of Guinea have five points and Mounana of Gabon none halfway through Group D with the clubs finishing first and second advancing to the quarter-finals. All six matches in the group have been won by the home team, leaving FUS Rabat of Morocco and KCCA on six points and Club Africain of Tunisia and Rivers on three. Record three-time Confederation Cup winners CS Sfaxien of Tunisia visit Group B strugglers Platinum Stars of South Africa having won 3-0 at home this month.